The January box contained: four calendar pages with blank space above, a variety of small rubber stamp shapes, a wooden block on which to glue the shapes, an ink pad, and a hole puncher. I spent a few days thinking about what to do with everything and I came to the conclusion that I wanted to use more than stamps to decorate the calendar - I wanted to put some inspiring quotes in there as well. My original intentions were to hand write everything in different fonts... but my penmanship just isn't that good and my first attempt looked downright silly. 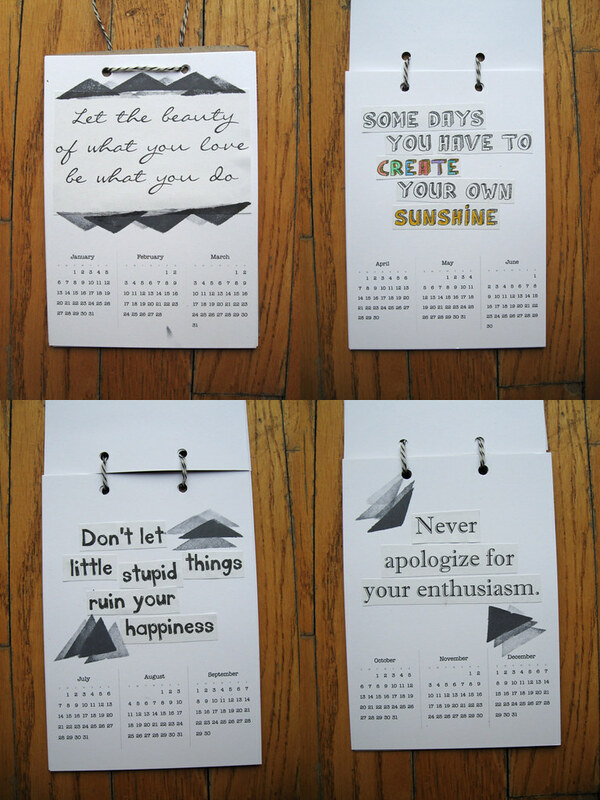 So instead I chose different fonts for the quotes, printed them all out, then cut and pasted them onto the calendar pages (Now that I can do!). I then used some triangular stamps for a finishing touch. Not bad for a project that sat around for over a month!